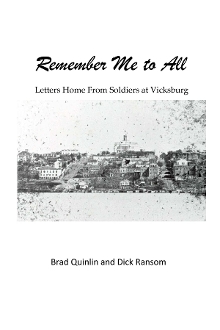 Remember Me to All leverages over 100 previously unpublished letters of both Confederate and Union soldiers woven into a compelling narrative surrounding the story of Vicksburg during the Civil War. From start to finish, Remember Me shares for the first time the personal experiences of more than 30 soldiers, north and south, through their letters sent to loved ones at home. The book examines their lives in camp and on the march during Grant’s Federal campaign to box in Pemberton’s Rebel Army, the siege of Vicksburg and much more. As the tides of war shift and fates are rearranged, the men share their feelings of joy and confidence or, for others, dejection and frustration at the outcome. Their loved ones at home are never far from the center of their attention, serving as a source of inspiration and hope as well as concern as the soldier’s absence resulted in much suffering on the home front that soldiers were helpless to assuage.